The Alaska Native Heritage Center when in Anchorage! Visit the Prism Pottery website. 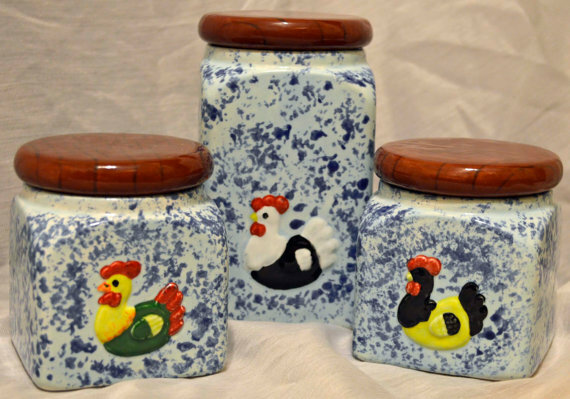 This sample of the work done by Prism Pottery features a three piece set which was sponge painted by hand with two bright blues and then the chickens were each individually hand painted. Each canister is three and a half inches in length and width, with the shorter two standing three and a half inches high, and the taller one standing six inches high. The tops were painted in wood grain colors and add another half inch to the height and have a rubber seal to keep it tightly in place. No two chickens are painted the same. Alaska Native Crafts and Art are best seen at The Alaska Native Heritage Center with collections showcasing all of the indigenous cultures in Alaska. There are native baskets, tools, watercraft, clothing, pieces of art, drums and more. See these Items on display in the Hall of Cultures when you visit Anchorage, Alaska. We are also pleased to introduce various local native artists which offer original native art, crafts and unique gifts for sale. The Art of Kevin Temple. 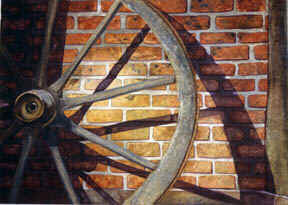 I am attracted to scenes involving strong clear light, that will cast strong shadows for subject matter. I look for a composition of strong dark and light patterns to create a dynamic tension and energy in a piece. My work is drawn from the realism of nature, but the overall pattern sometimes creates a sort of abstraction. Color is planned to enhance the tensions and drama in my overall compositions. To contact me for quote or commissions- You may call 10:00am - 6:00 PM Alaska time at (907) 223-0171 . Copyright 2014, Alaska Internet Marketing, Inc. All rights reserved.